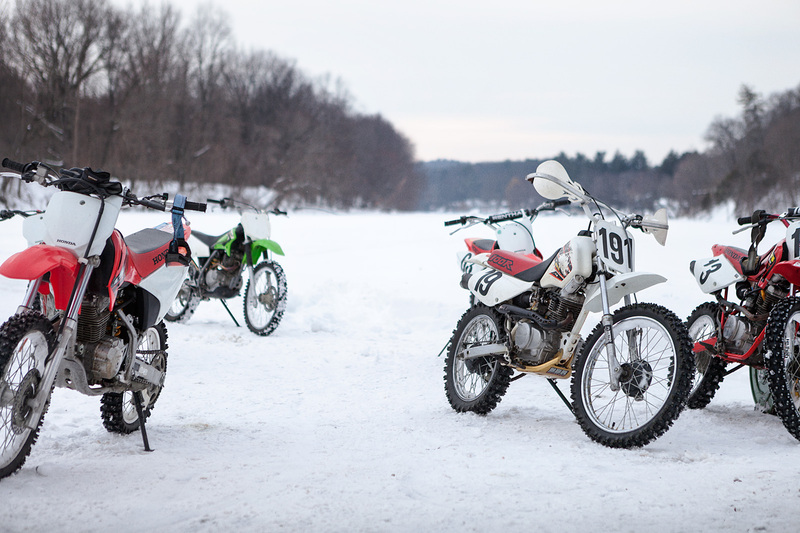 Winter in New York is always hard for motorcyclists. As ice and snow cover the streets, we put our bikes in storage, and spend hours reminiscing about summer, longing for spring, and cursing the Instagram feeds of our friends in warmer climates. This year has been particularly long and hard, and so I decided to make the most of it and use every minute and dime I had repairing and sprucing up my two bikes, as well as learning something new! 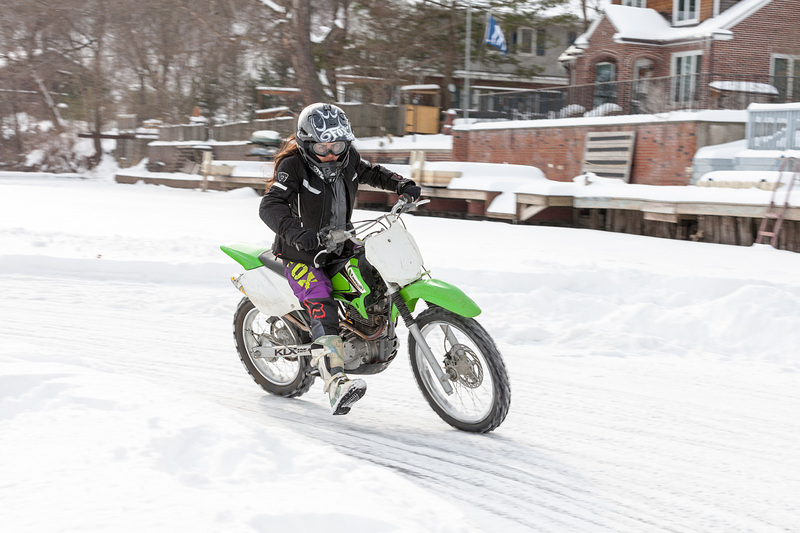 I’ve done a little bit of flattrack, by way of American Supercamp a few years back, and last year on the track with the help of fellow Miss-Fire Kara (Check out that story HERE). Kara races with Five & Dime Racing and just split town to defend the #1 plate in her class (ead her story HERE). 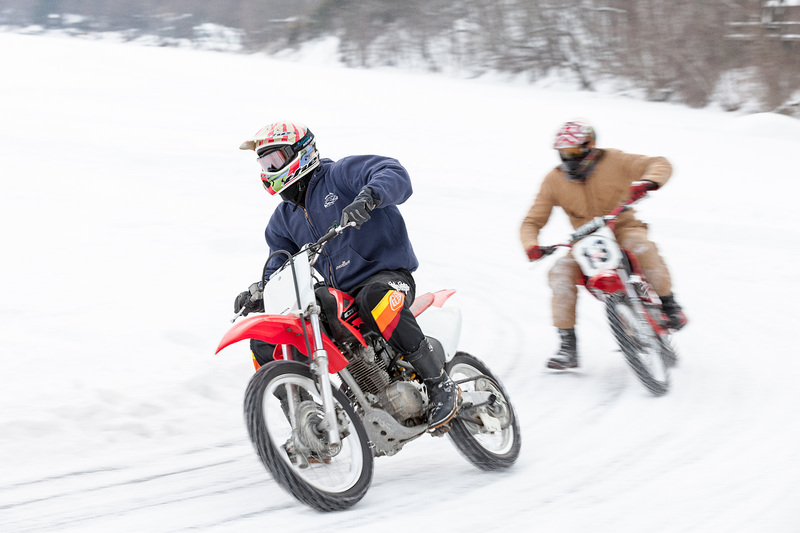 So this winter, my goal was a similar, but even crazier sounding sport, Ice Riding! drilling screws into tires for grip. It took a few weeks of talking to friends, asking technical questions, and inquiring about secret locations, but after not too long, I’d found a schedule for races 3 hours away and hopped in the car with some buddy’s to check it out. In short, it was everything I’d hoped for, cold, crazy, and so much fun to watch. We had a great day, and that started the ball rolling. More friends popped up with advice, and even offered to take me up to a private track on a river upstate. So, after getting the best text ever (above), I ran on over to Works Engineering and we spent several nights eating pizza, drinking beer and drilling thousands of screws into knobby tires. Bright and early the next morning, we packed up the trucks, and headed upstate. 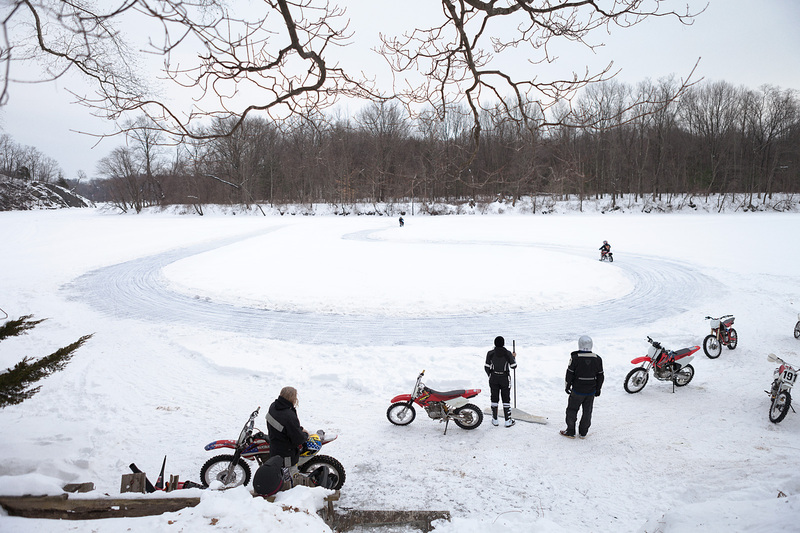 The track was cleared and waiting for us along with a fire pit to keep warm in between turns courtesy of our gracious hosts, a lovely couple who race motorcycles, including flattrack. It was great to watch everyone from the kids to the pros, find their way around the track. and I quickly came to understand the techniques that had been explained to me prior. 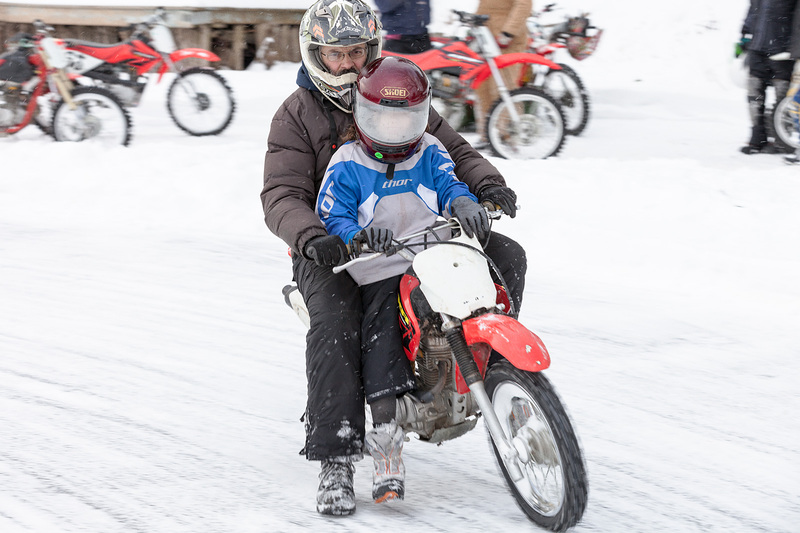 On dirttrack (or flattrack), you accelerate down the straight-aways, then lean and slide he bike around the turns with your leg extended out and into the turn, and that arm pushing into the handlebars, while your outside arm is raised high, and that leg is on the pegs and pushing against the tank. Looking all the while far down the track. That lesson of looking where I want the bike to go and it will go there, is something I originally learned riding horses years ago and it’s still one of the most valuable lessons I ever learned in regards to motorcycling, and I use it every day. With the addition of the screws into the tires, the amount of grip is surprising. 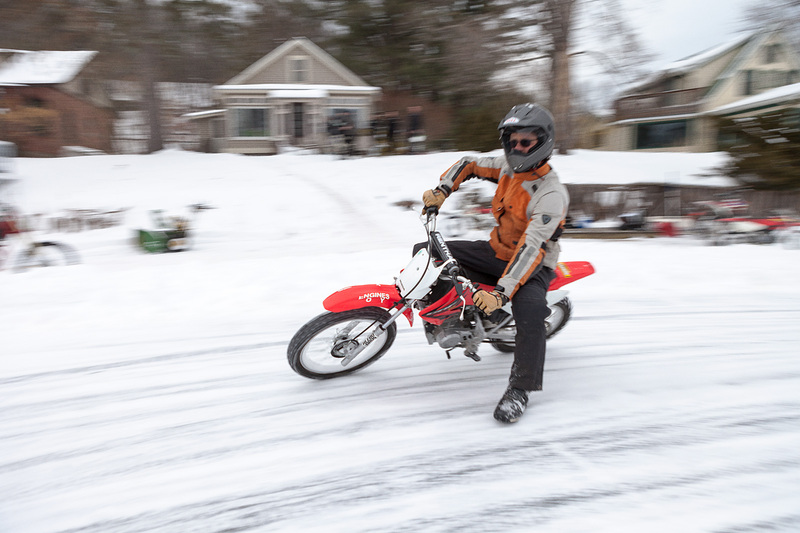 I had envisioned sliding all over slick ice, as if I was ice skating in dress shoes but in fact, The bike felt completely in control, and powered through the ice with grace and stability. Getting it to slide was indeed very similar to conditions of a dirttrack and after only a few turns, though I was slow and wobbly, I was starting to get it! 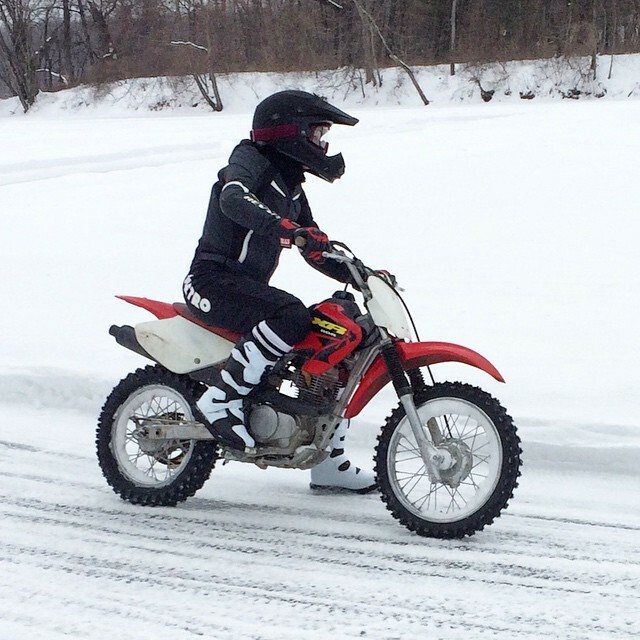 Being new to not just ice riding, but motorcycle as off-road sport in general, gear was daunting. 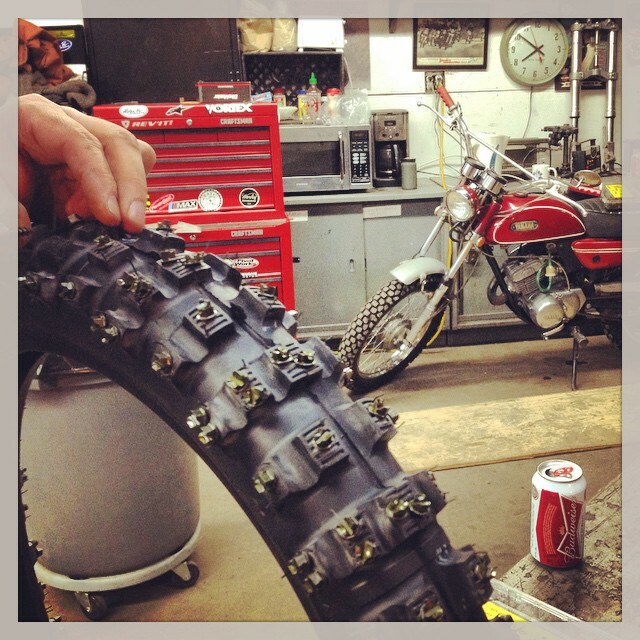 I did a bunch of research and found that it’s very similar to motocross, with some cold weather additions. You want to be warm, protected, and yet still able to have a full range of motion. I also found that an open MX helmet and Goggle combo was necessary as a full face helmet with flip down shield was prone to fogging badly. 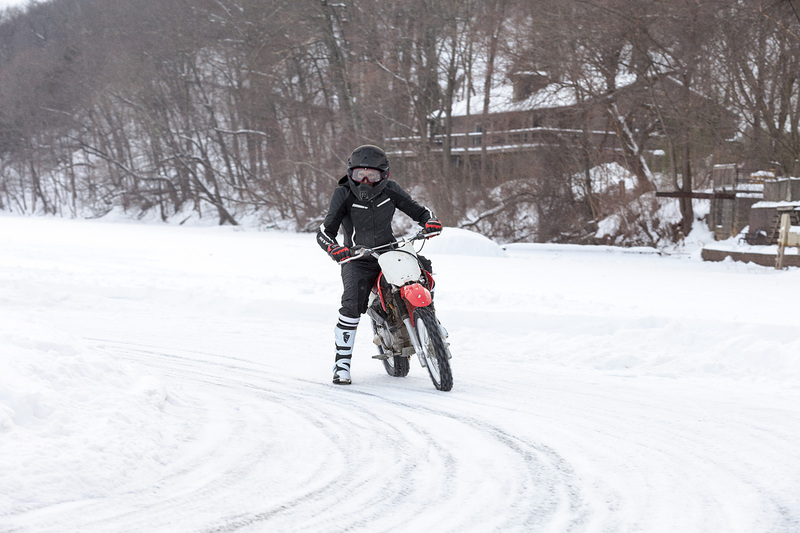 All in all, an amazing day spent with friends learning a new skill and challenging myself with every turn on the track, and the only think that’s almost made me wish winter will last just a little longer…ALMOST. This entry was posted in Adventures, Members, Motorcycles, Vehicles and tagged barstow goggles, ice racing, ice riding, metro racing, misfires, miss-fires, missfires, motorcycle house, motorcyclehouse.com, rev'it, ride 100%, ryan handt, the miss-fires, the missfires, thor, ugly bros jeans, works engineering. Bookmark the permalink.